I sent him to get a PANO but our machine was down. They’re painting in the x-ray room apparently. I managed to get an assistant to get a periapical shot of the tooth. Gave the guy his options, consented him, and had the tooth out in five minutes. I went to go put in his prescriptions into the system. Motrin 800 (30 tabs) 1 tab tid; Roxicet 5/325 (twenty) 1-2 t q 4-6h prn extreme pain (maybe overkill in hindsight considering the ease of the procedure, but my usual rx for extractions). I submitted the Rx and double checked it to make sure it was in. I finished up with the patient and was out the door in five minutes. The system we use to enter these scrips is called CHCS. 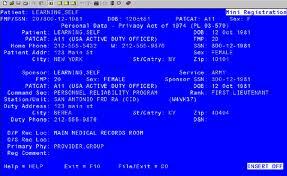 It is a DOS based system from the early 1980s that links all the military treatment facilites to the pharmacies. This allows us to enter prescriptions under password protected access from any facility and have it just pop up in the local pharmacy. It is an antiquated system that reminds me of trying to play computer games on the PC my dad built in 1986. C:/new rx. etc.